Glendale’s newest senior-living community Orchard Pointe at Arrowhead prepares to open next month, offering two specific and cutting-edge programming options for residents with cognitive impairment. The community, located at 17200 N. 67th Ave., will offer both assisted-living and memory-support apartments. The team is currently refining its specialty programming rooted in the same philosophies Dr. Maria Montessori used when working with children. Many are familiar with Montessori methods for children but few understand the power and benefit of applying the same principles to those with dementia. The two programming options are Portraits and Snapshots. Both methods use Montessori techniques that focus on stimulating the senses and creating activities that match each resident’s interests and abilities. The goal is to support cognitive loss residents face by creating programming that adds purpose and meaning to their lives. Often, for assisted-living residents with mild cognitive impairment, large crowds or highly stimulating experiences are too overwhelming and intimidating for someone in the early stages of cognitive decline. Fear about not knowing how to do a task properly, or worries about others noticing their confusion, may prevent them from enjoying life the way they normally have in the past. For these residents, Snapshots was created in an effort to ensure that all residents have the opportunity for social engagement. Specially selected activities for this group of residents helps increase engagement, and the structure can take place in a group setting or one-on-one, whichever method the participant needs to be most successful. Snapshots was created to provide a vehicle for residents to enjoy leisure activities one again, by receiving hands on assistance from a team focused on enrichment. The Portraits program has been developed as a way to give residents with more significant memory loss and Alzheimer’s disease in the memory support communities, distinct roles and routines. While Snapshots takes places at scheduled times each week, Portraits is an ongoing way of life each and every day. All associates are responsible for engaging residents to retain, exercise and stimulate their remaining abilities. Associates have been trained to have deeper understanding of the Montessori teachings, and how to apply those to varying dementias. The Portraits team gathers and reviews information about each resident’s life and notes their daily observations and interactions. From here, and Individualized Portraits Schedule is crafted. This schedule is a personal activity and program guide, developed to help residents succeed with everyday life activities that are best suited to their abilities, interests and needs. Portraits takes a unique approach to capturing moments of joy, wellness and peach for every resident. By taking the resident’s ability, desire and skills into account, custom programming is created for each person. The goal of both Snapshots and Portraits is to help residents be as independent as possible, give them a meaningful place in their community, support their positive self-esteem and provide opportunities to contribute to their community. One example of Portraits in action is a resident by the name of June, who was an avid reader and school teacher. While she was often quiet among large groups, the Memory Support director suggested she join a reading group with books designed for those with dementia. June now leads this group and has encouraged other residents to participate. This gives June a purpose each day and she is now engaged and takes ownership over this area of her life. Another resident in one of the memory support communities could not communicate well, yet her son came to visit every single night. For years they would just sit together and watch television. When Heritage Communities, parent company of Orchard Pointe, implemented Portraits and learned about her past love of beadwork, they tailored an activity solely for her. Now, she and her son are seen stringing beads and making jewelry together. It gives the resident purpose, but also provides an activity that bonds the family members. 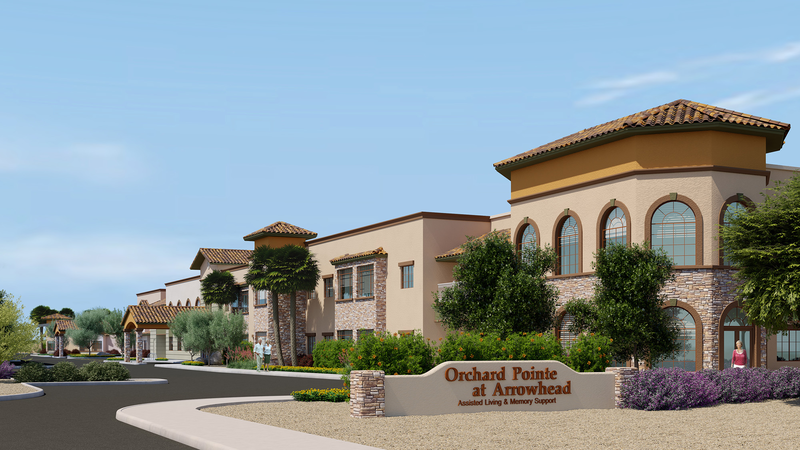 Orchard Pointe is a part of Heritage Communities, which owns and manages 10 senior living communities, including one in Surprise and a future location at 67th Avenue and Happy Valley Road in Peoria. For more information on Orchard Pointe or Heritage Communities, visit www.heritage-communities.com. To read the full article in Glendale Today, please click here.